LONDON - The Labour Party is launching a system to integrate Labour MPs' websites with Twitter and Facebook in a bid to help them better communicate with their constituents. The new system, created by the party's digital agency Tangent One, will mean that whenever MPs add content to their website it will offer them the option to Tweet about it on Twitter and update their status on Facebook. 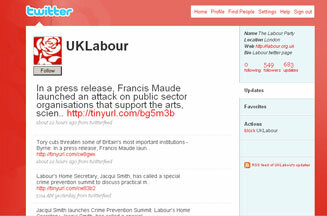 Labour MPs can add sections to their website showing their latest Tweets, their Twitter followers, their Facebook status, the groups they belong to and their Facebook friends. A guide will be distributed to MPs this week on how best to use these social media websites to engage with constituents. Greg Jackson, Tangent One's chief executive, said that Twitter had grown tenfold in the last year and had higher penetration in the UK than the US.